Hyundai Heavy Industries (HHI) Ulsan shipyard, located on the south eastern tip of the Korean Peninsula, is the largest shipyard in the world. Image courtesy of Hyundai Heavy Industries Co., Ltd.
From 1972 to 2013, HHI has delivered more than 2,981 vessels to 268 ship-owners in 48 countries. 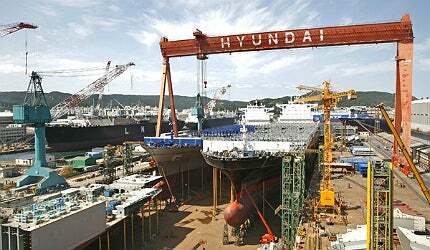 Image courtesy of Hyundai Heavy Industries Co., Ltd.
HHI's Ulsan shipyard has ten dry docks. Image courtesy of Hyundai Heavy Industries Co., Ltd.
Ulsan shipyard extends across two and a half miles along the coast of Mipo Bay and covers an area of 1,780 acres. Image courtesy of Hyundai Heavy Industries Co., Ltd.
Hyundai Heavy Industries (HHI) is one of the biggest ship construction companies in the world. Its ship manufacturing facility in Ulsan, a South Korean city located on the south-eastern tip of the Korean Peninsula, is the largest shipyard in the world. The shipyard extends across two and a half miles along the coast of Mipo Bay in Ulsan and covers an area of 1,780 acres. Due to its strategic location, the shipyard can be easily accessed from and to the open sea. Construction on the Ulsan shipyard commenced in 1972 and it was commissioned in 1974. Meanwhile, HHI also christened two very-large crude carriers (VLCC), each of 260,000DWT. Construction of the ships as well as the shipyard was carried out simultaneously. "Ulsan shipyard has ten large-scale dry docks with nine Goliath cranes. This allows HHI to manufacture any type of ship of any size." HHI commenced ship construction at its Ulsan shipyard in 1972 with two VLCCs. A christening ceremony to mark the completion of the first two VLCCs was held in June 1974. Ten years later, Ulsan shipyard delivered its first two VLCCs and achieved ten million DWT in aggregate ship production. The shipyard reached a 20 million DWT production milestone in 1988 and 50 million DWT in 1997. It achieved an aggregate production mark of 100 million DWT in 2005. From 1972 to 2013, HHI has delivered 2,981 vessels to 268 ship-owners in 48 countries. Today, it commands around 16% of the world ship manufacturing market. In 2011, a total of 82 vessels were built in the shipyard with an aggregate of 10.1 million DWT. HHI surpassed the 100m gross tonnage (GT) in ship deliveries in 2012. It received an order to construct the world’s biggest containership of 19,000TEU in 2013. Different types of vessels manufactured in Ulsan shipyard include bulk carriers, container ships, tankers, VLCC, product carriers, multipurpose cargo ships, ore-bulk-oil carriers, Ropax, pure car carriers, LPG carriers, RO-RO ships, chemical tankers, offshore rigs / barge and LNG carriers. Ulsan shipyard also builds naval ships and special-purpose vessels for the Republic of Korean Navy. The shipyard is equipped with advanced technologies to design and fabricate modern submarines, naval ships and special-purpose vessels of various hull forms. This work is overseen by HHI’s Special and Naval Shipbuilding Division (SNSD), a government accredited national defence industrial shipbuilder and engineering consultant for the South Korean Navy. South Korea’s first indigenous frigate, Ulsan-Class, was built in the Ulsan shipyard in 1980. Workshops and facilities within the shipyard are put up in such a way that the maximum efficiency of shipyard operations can be maintained. Out of the total area of 1,780 acres of the shipyard, the workshops cover approximately 395 acres. "Ulsan shipyard also builds naval ships and special-purpose vessels for the Republic of Korean Navy." Ulsan shipyard has ten large-scale dry docks with nine Goliath cranes. This allows HHI to manufacture any type of ship of any size. Dry Dock 1, which measures 390m x 80m and is equipped with two Goliath cranes, is used for constructing LNG carriers. HHI also built the world’s first T-shaped dry-dock in 2009 creating additional space for Dock 1 measuring 165m long, 47m wide and 12.7m high. Dry Dock 2 is 12.7m deep and measures 500m in length and 80m in breadth. It is equipped with two jib cranes. Dry Dock 3, measuring 672m in length and 92m in breadth, is the largest dock of the Ulsan shipyard. It is capable of undertaking simultaneous construction of a variety of ships and is provided with two Goliath cranes. Vessels of up to one million DWT in capacity can be constructed at this site. Dry docks 4 and 5 are comparatively smaller in size and can be used to construct ships of up to 150,000 DWT and 70,000 DWT respectively. Dry docks 6 and 7 are specially equipped for the construction of naval ships and special-purpose vessels. Dry docks 8 and 9 were completed in 1996 and are currently allocated for building VLCCs. HHI has an H-Dock, again the world’s first dry dock for building offshore vessels. The H-dock measures 490m long, 115m wide and 13.5m high. The deep dock has a capacity of 1m DWT. HHI’s shipyard is outfitted with cutting-edge facilities and the latest equipment, ranging from fully machine-driven steel-cutting lines to an eco-friendly painting shop. Other advanced facilities include a metal works factory, a forge, machine shops, a crankshaft shop and offline welding robots. HHI also developed an automatic painting spray head for painting the bottom of ships in September 2014. Enerpac is a designer and builder of nautical engineering and maintenance tools. Its equipment can provide significant energy-efficiency compared to manual products.